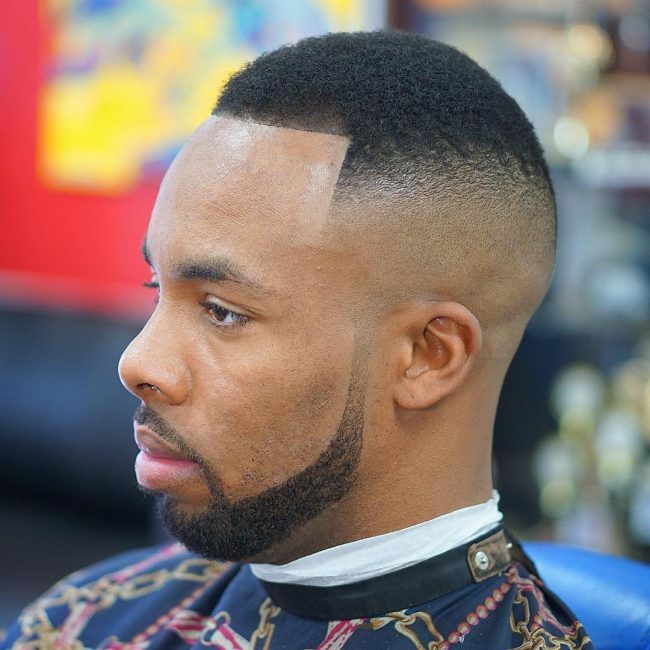 An Afro fade is a haircut that is characterized by a gradual hair tapering, but it is more inventive and chic that other types of fade. Although it requires a high level of skill and it is also quite laborious, the results are very impressive, and this makes it worth the effort. 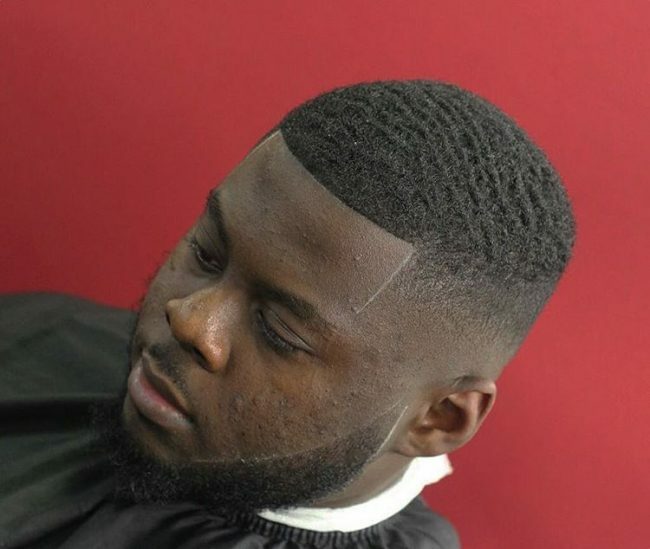 No other cut will give a man the clean feel and fresh look of this fade, and the good thing is that you can still have any other design at the top. And so if you are looking for some inspiration on how to rock this trendy haircut hers is a gallery of 90 amazing pictures. 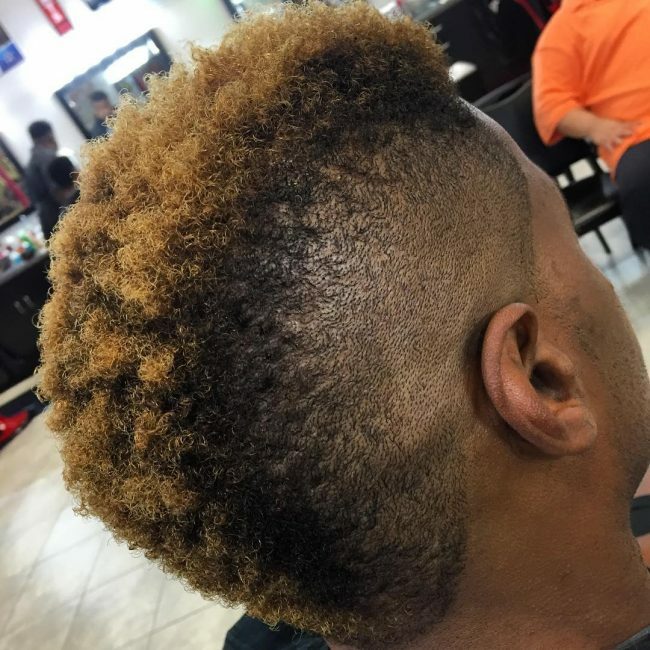 This haircut is very inventive because the back is not faded or tapered but it is instead in a medium length, and this creates a faux hawk like design. The natural texture of the hair is also fabulous, and it will give you many options since you can use almost any type of fade on the sides. 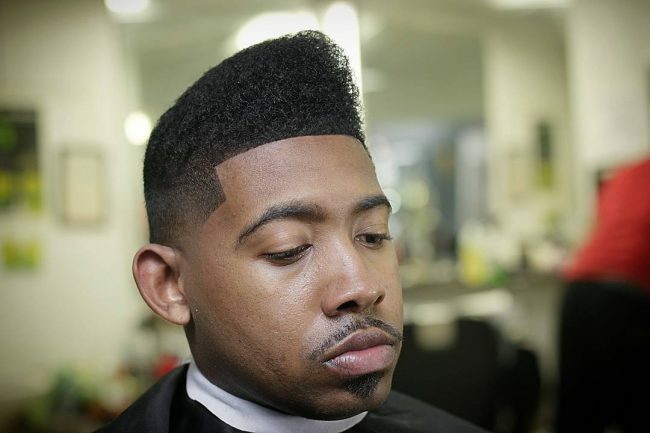 A classic high top makes a neat and decent haircut that a man can use to create a charming look. In this design, it has an extra height that adds to its beauty and elegance. However, the tapering on the sides and the angular cut at the front are what makes it an edgy haircut. 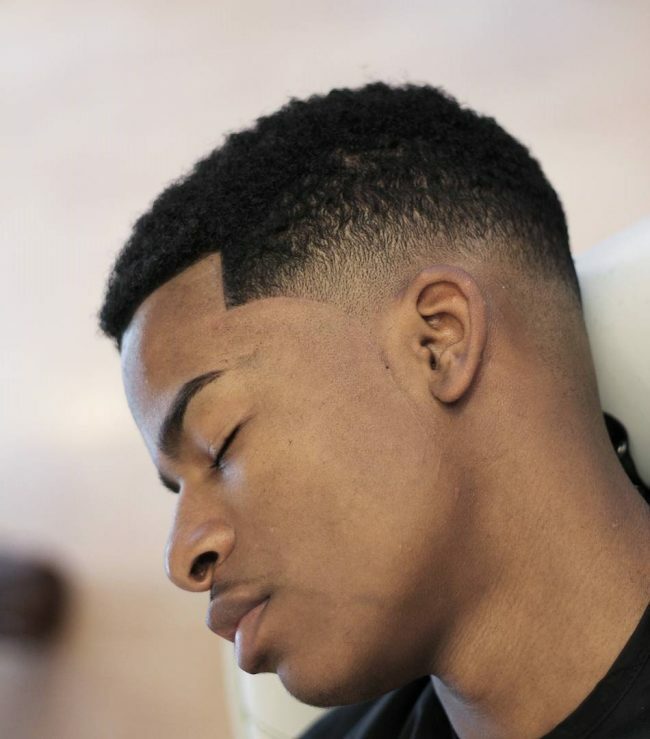 You do not have to shave the strands on the sides and back completely to wear a faded design because you can still achieve one by cutting a small section like in this style. Here only a few inches on the sides is cut to accentuate the fabulous Frohawk. You should also have a few razor lines on the short section to spice up the look. If you would rather keep your hair low, then this is a perfect style for you as it maintains some short strands with smooth waves that make them design look splendid. Apart from the waves the angles on the design and the high tapering is also fantastic. And if you have long facial hairs you should give them an angular cut like this one and create a disconnection to have a refined appearance. This haircut is another example of a design that you can create when you want to leave your stands very short. It is very close to the scalp, but it has some neat angles at the front and on the facial hair that make the design look very polished. 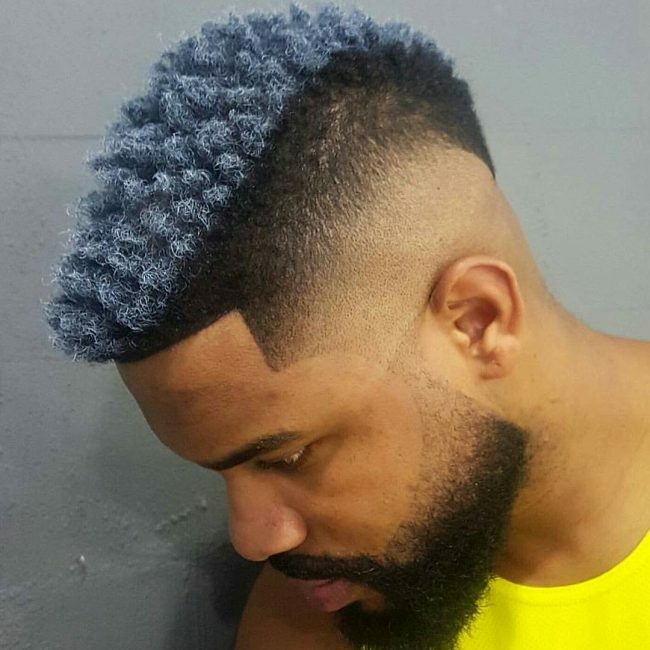 Apart from this the hair also has a zero fade section that creates a disconnection with the beard. You do not have to shave a lot of your naturally textured locks to create an elegant look. A simple tapering on the sides is enough to give you a refined style like this one. And the only thing you have to do is to give it some sharp angles and also do the tapering neatly. 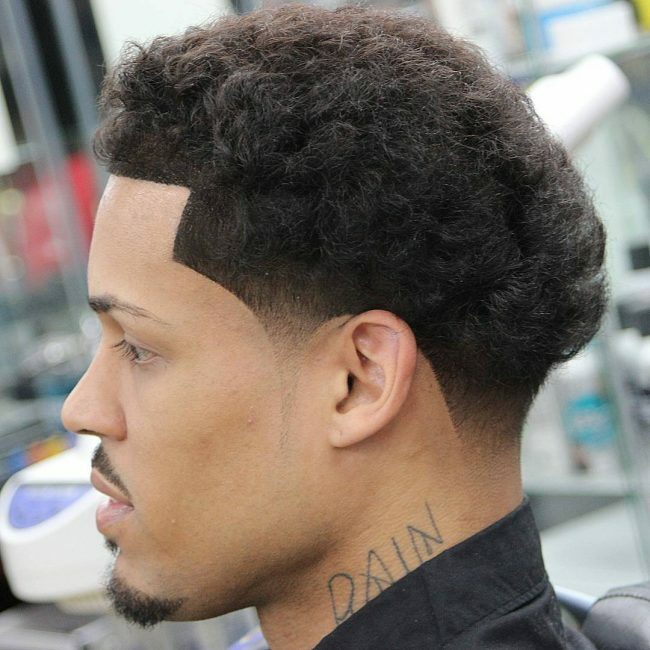 Modern haircuts like this one do not exaggerate anything, but they have very precise and skillful cuts. 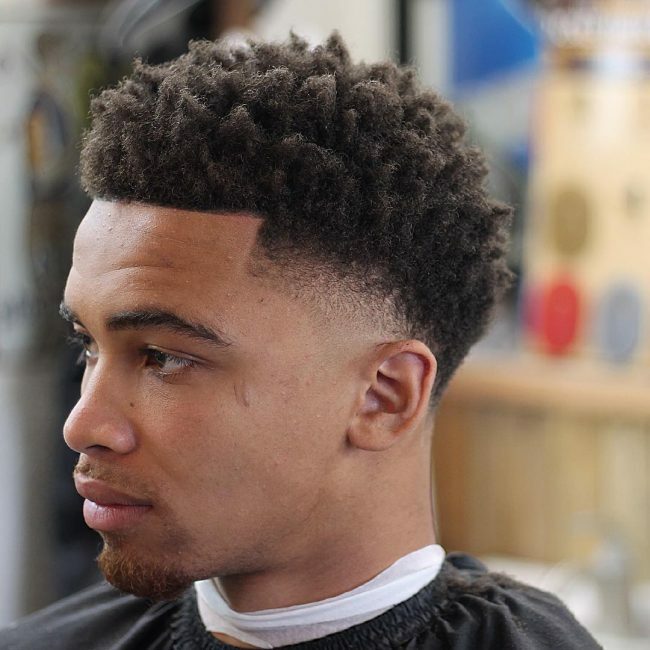 The design has a flawless full tapering and the strands in the middle should be tapered towards the back and finish by combing them to create a neat look. You should also trim your beard and shape it innovatively as this will enhance your overall appearance. Blurry fading may be a simple hairdo, but this one looks very distinct because it has a dramatic cut that makes it look splendid. 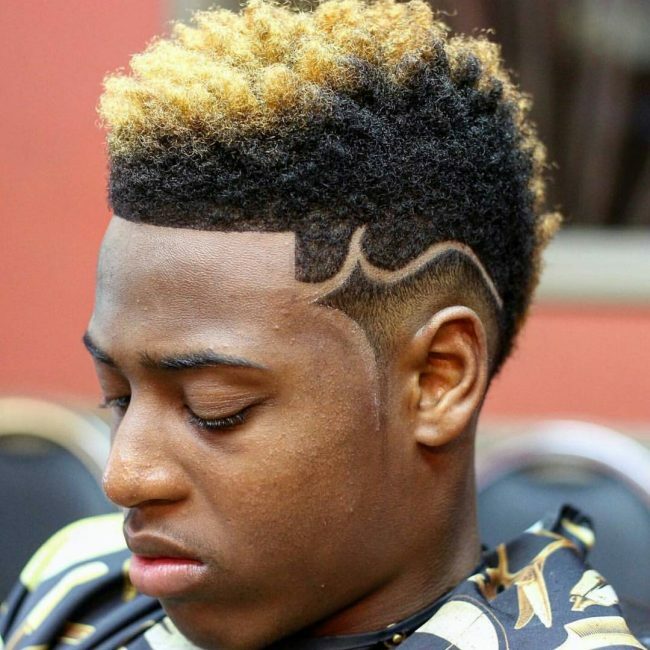 The razor cut lines on the sides are marvelous, and they give the style a trendy look. However, the simple pony knot on the crown also adds to the beauty of the design. The natural twisted locks on the top of this headdress look amazing, and they will make a man look very refined. They also have a brightly colored patch that enhances their appearance. However, the curved line at the front and the high fade are still what makes this a classy style. It is always hard to shave your dreads even when you want to change your appearance. However, you can still maintain them on the crown like in this style and then have a skin fade on the sides to create a polished look. By doing this, you get to keep your dreads and also change your overall appearance. The bleached blonde look in this design is what will catch the attention of most people, but there is still more to the style than this. These short strands also have some cute natural curls and a classic tapering on the sides that helps to make the style look magnificent. 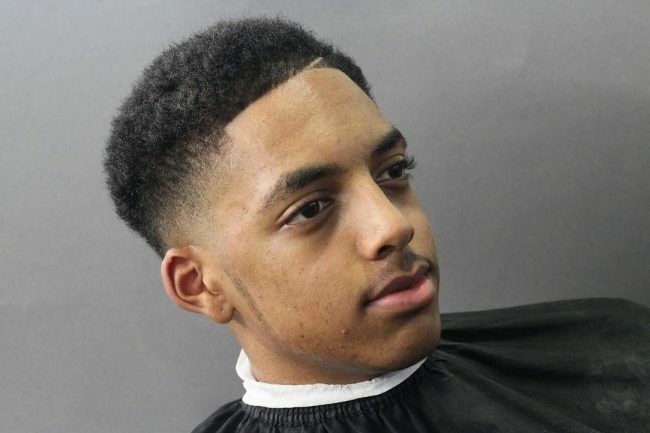 Any African American man who wants to wear a formal look should try this haircut if he wants to stand out. Although it is very short, it is also very elegant, and it has a distinct gentleman look that will turn heads. It is also very easy to create as you only need to chop the top short and then give it a high fade on the sides. You should finish with a short beard that should have a precise shape. This haircut gives you an idea of what you can do to your strands if you prefer to have some extra height. The strands are perfectly textured, but their spiky look is what makes them trendy. The tapering on the sides is also magnificent, and it helps to spice up the design. 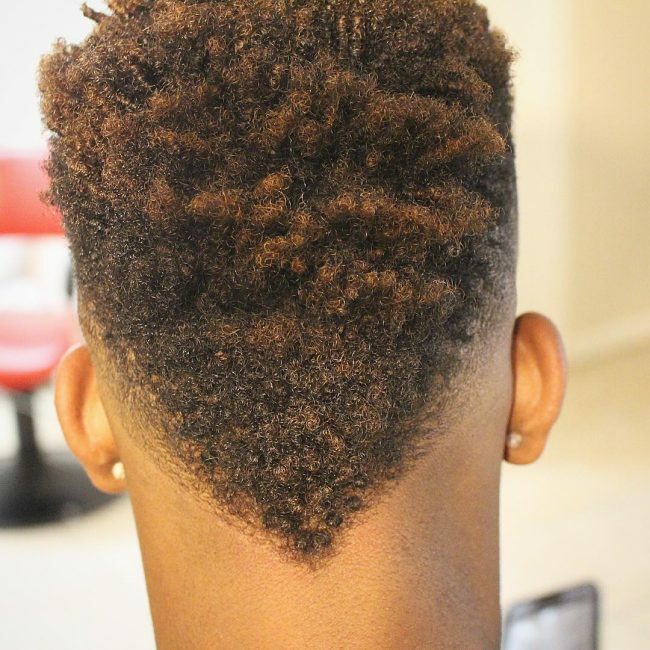 Some people will describe this design as an undercut that fades towards the nape line and sides. 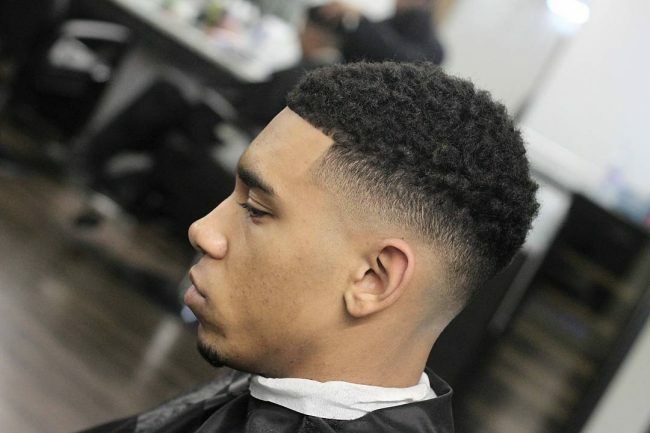 Although this is also a correct description, the easier one is a high fade with a sharp side part line that creates a disconnection with the curly top. The brown color of the hair is also splendid as it makes it more attractive. The sleek waves on the top section of this headdress are incredible, and they will make any man look exquisite. 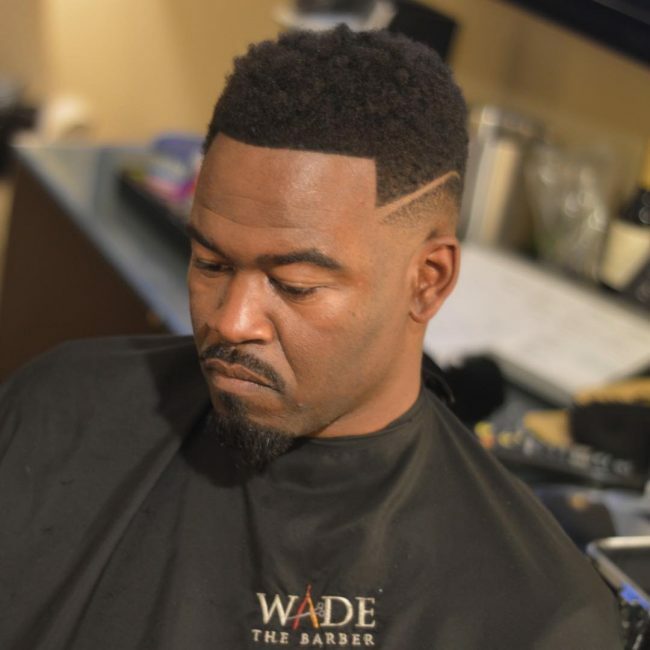 However, the geometric cuts on the sides and the hard part line also help to enhance this look as they add some detail to the faded section of the hair. 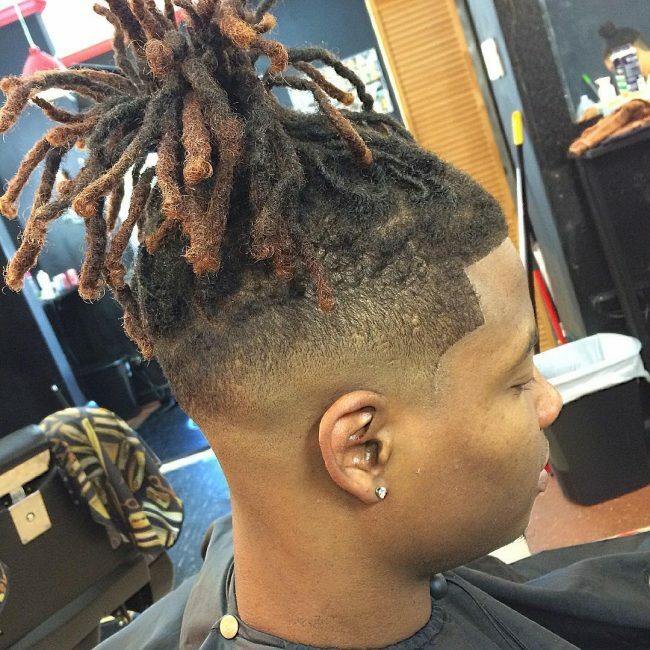 This haircut is another example of how you can use your dreads to create a refined look without having to shave them. 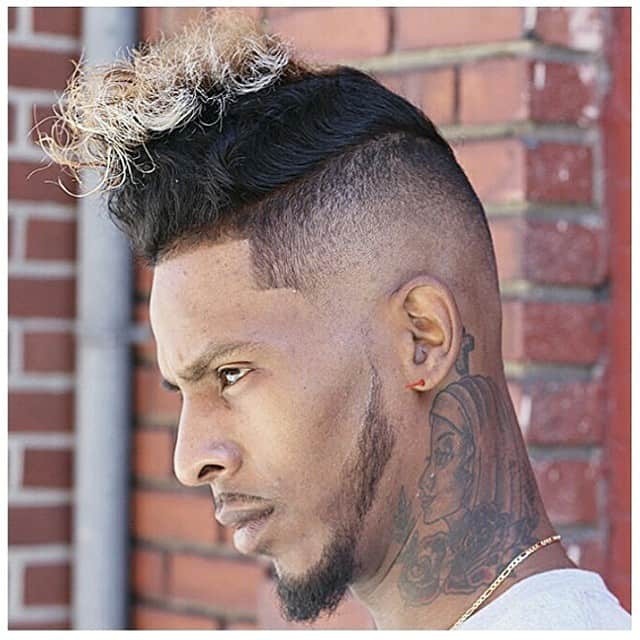 It involves tapering the sides and then creating a wavy razor line around the dreads at the top of the head to separate them from the faded area. Every person looking at this headdress will want to have a second glimpse because the design on the top is very creative. However, it is also very easy to create because you only need to leave a long wavy hair and then give its ends a blonde dye job. You should then finish the look with a high fade on the sides and back. 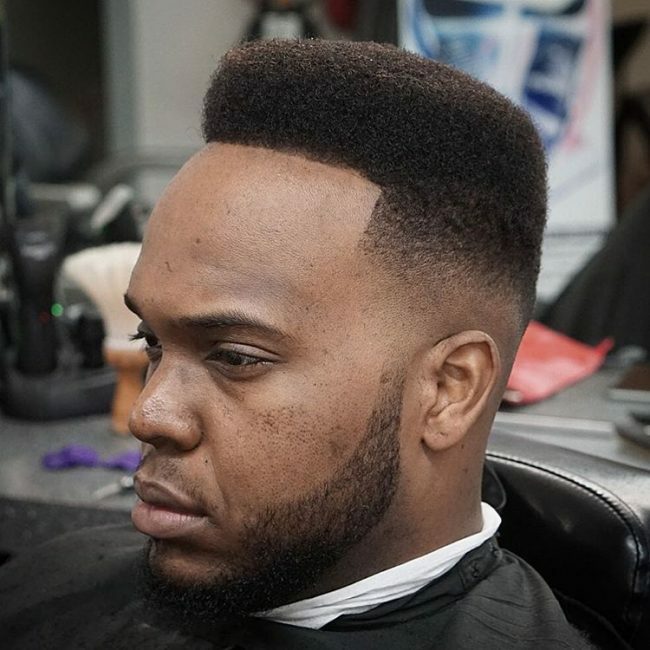 The high-top design in this hairdo is very impressive, and you can tell that the barber took a lot of time to ensure that it is not just high but also very straight. 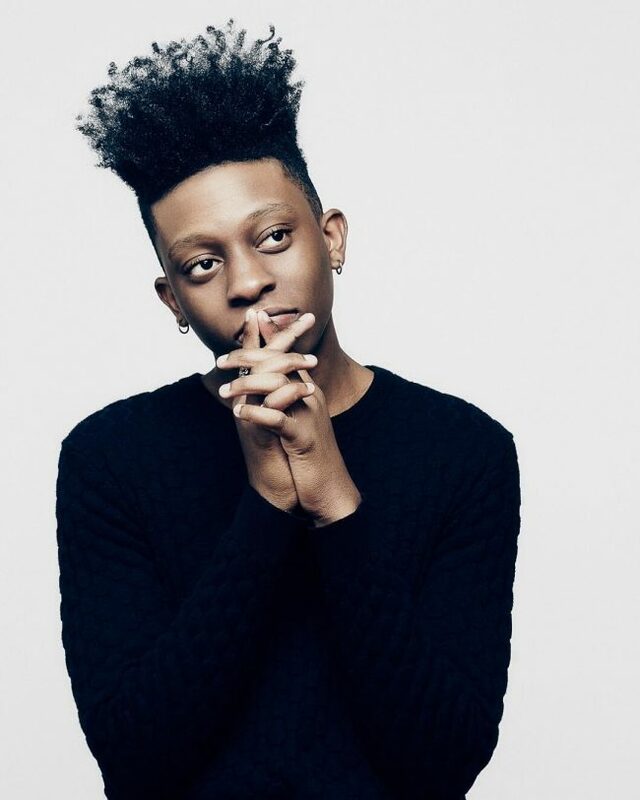 Apart from this he also creates a lovely Afro fade on the sides and some sharp angles at the front that help to enhance the look. Adding some color to your short strands is a good way to add a twist to your overall appearance. In this particular design, the short strands also have some beautiful waves that make them look very detailed. 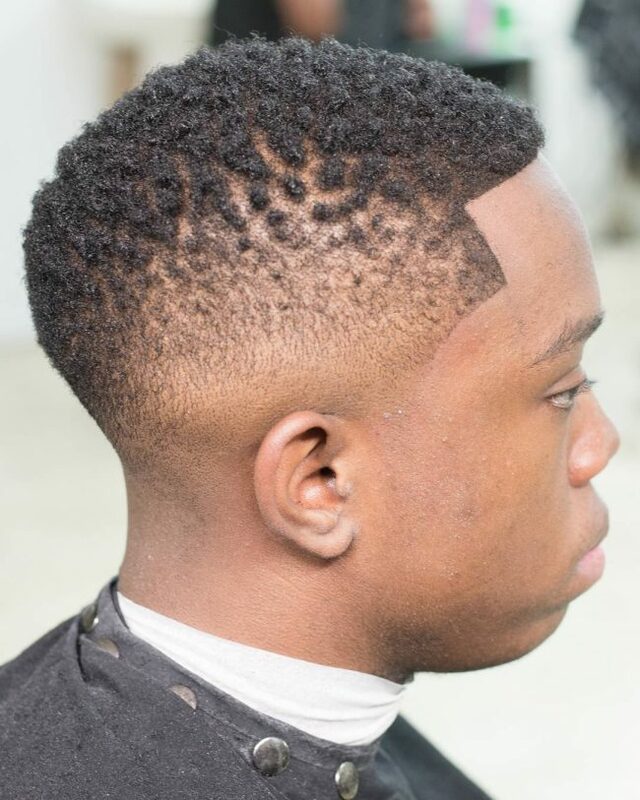 The tapering on the sides is also magnificent, and it helps to make this a top notch haircut. 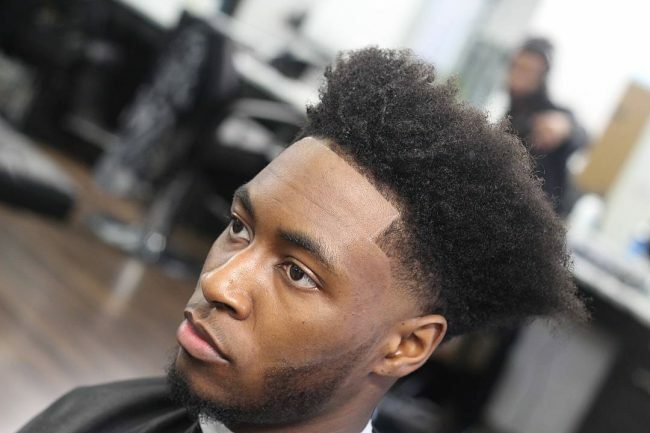 If you do not want to have the exaggerated look of a high and flat top, you should get this Low Top design because it uses the same concept but keeps the hair closer to the skull than the typical ones. Apart from this it also has a magical blue color and an outstanding tapering design on the sides that makes it look stunning. 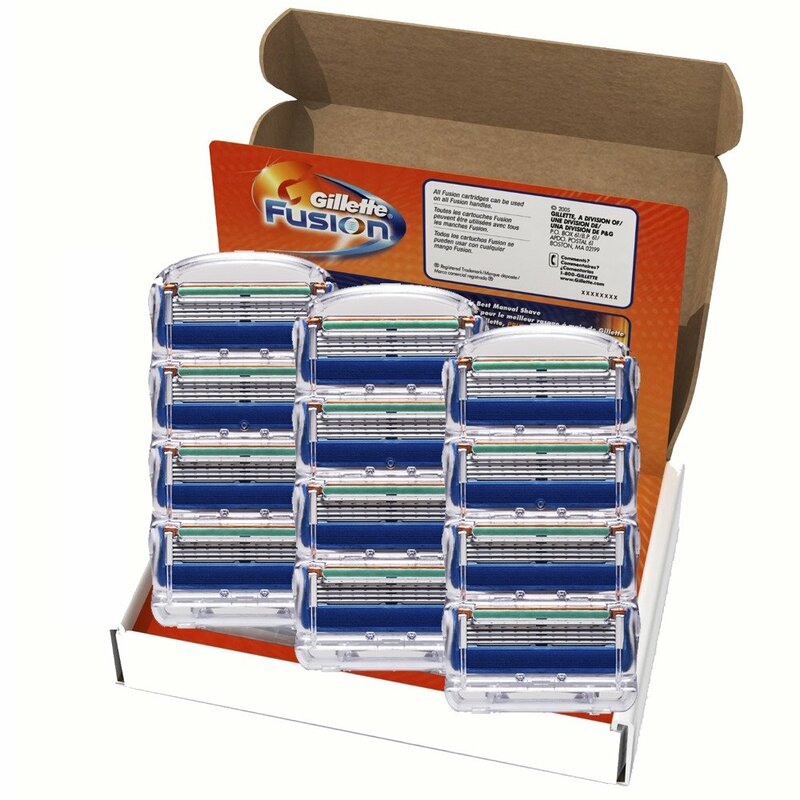 This Box Top design looks amazing, and this is not only due to the precision in the cut and neatness but also because it has a diagonal razor line that helps to spice it up. Apart from this it also has a neat tapering on the sides and back that gives it a classy appearance. Mohawks will never go out of trend because you can wear one in many ways, and so you only need a little creativity to create a unique headdress. In this style, the design maintains a curly hair at the middle that also has beautiful brown shade. The sides of the Mohawk also have a razor fade, and this makes the design different because the typical ones have the sides cut very close to the skull. African American strands have a unique texture and volume, and this is what makes it possible to wear a polished hairdo like this one. It involves leaving a long hair on the crown and then styling it by upsweeping to create an extra high top design. You should then finish it by tapering the sides and back to make them short. It is amazing how a simple thing like making the side and back of your hair short can transform your appearance. 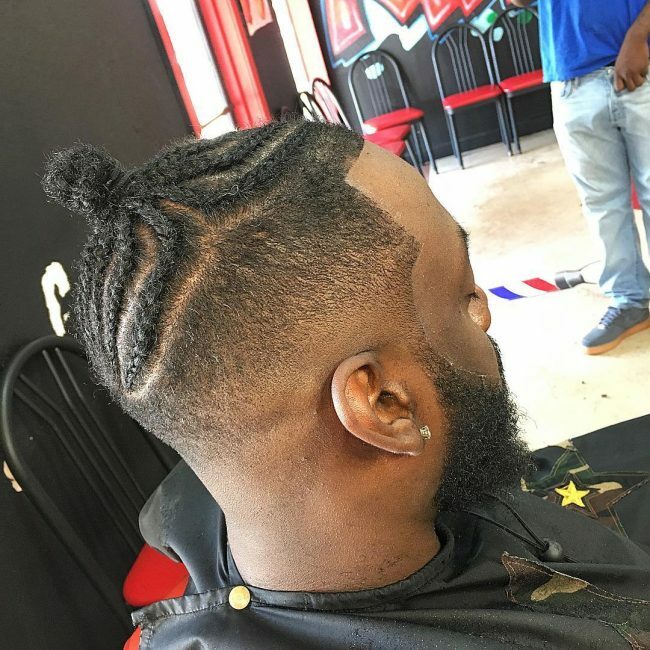 In this style, all you need to do is to the chop a few of your dreads on the sides and back. 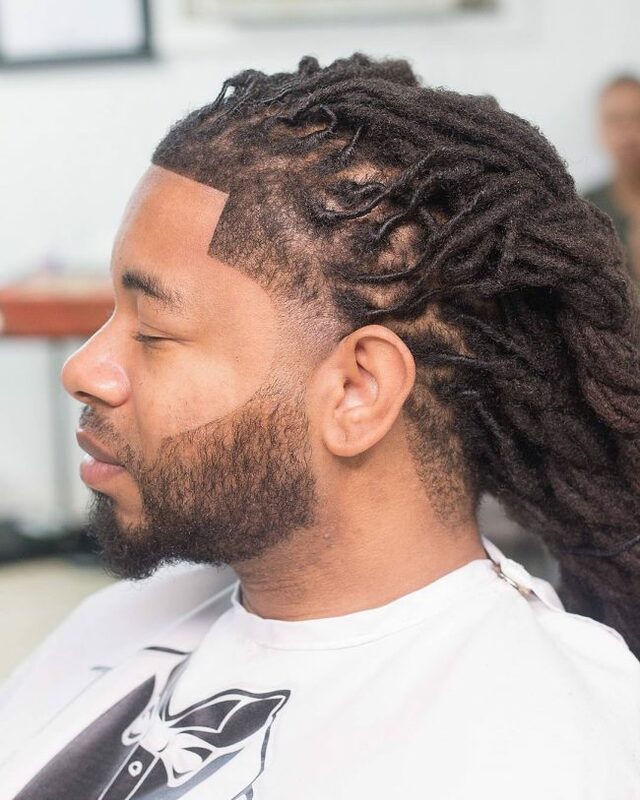 You should then do some smooth tapering on these areas and then style your dreadlocks by making them slightly mess to create a classy headdress. An afro is one of the most famous hairdos with African Americans, and this is rightfully so because it works well with their hair texture. The one on this style comes from a medium length hair, and you should accentuate it by giving the sides and back a zero fade. 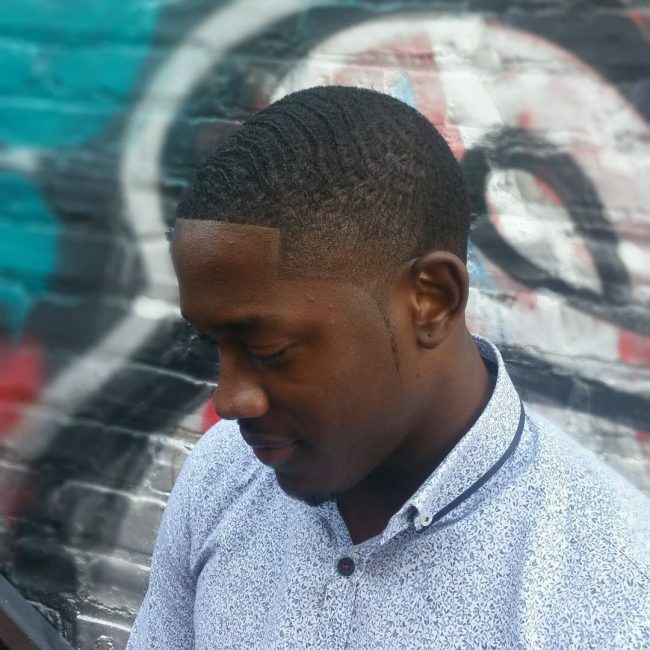 This haircut may look very sophisticated, but it is very easy to achieve provided you use the services of a skilled and experienced barber. It starts by tapering the back while leaving the front natural. 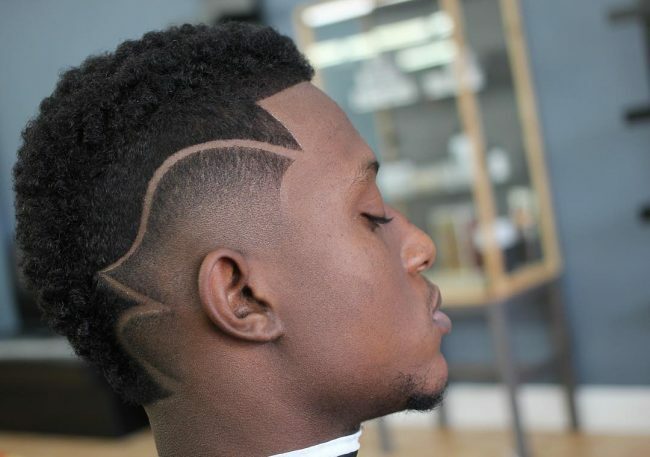 You should then create some right angles to make your style look fantastic on the sides. 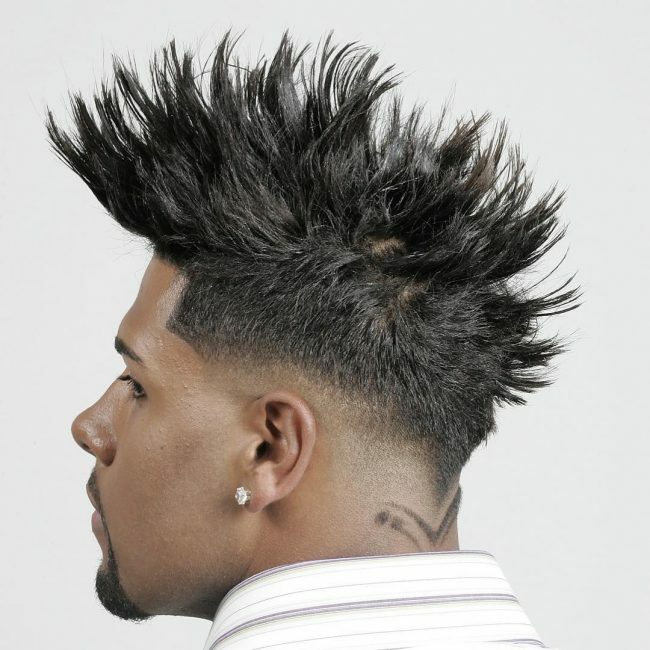 # 27 Faux Hawk with Intricate Razor Pattern. The curly hair in this hairstyle creates a very delightful faux hawk design, and all that you need to do is to chop the sides. However, you should not just make it short, but you should instead have a high fade. You should them finish the design with some intricate razor patterns on the short faded sides as this will help to make the style look trendy. 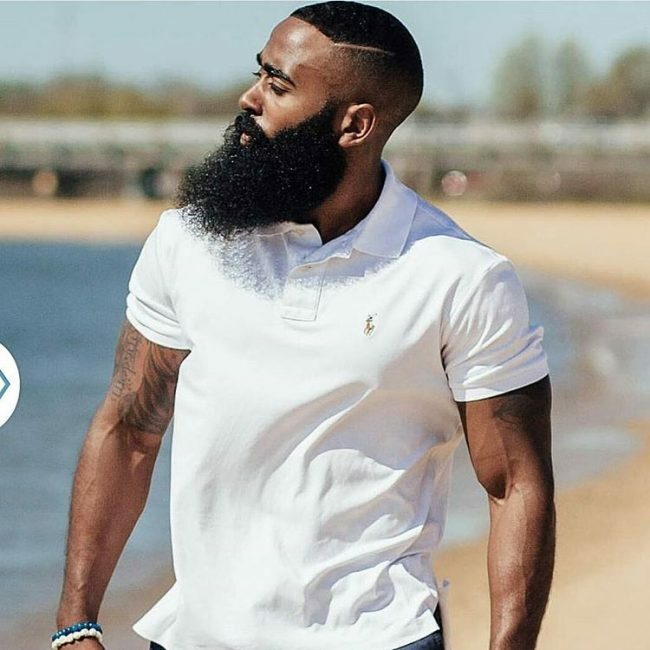 The massive beard is what will steal all the attention because it is not only big but also impeccable and it will make a man look very modern. However, the haircut is also top notch, and you can tell that it is the work of a very skilled and experienced stylist. It involves trimming the strands on the crown very short and making them wavy. You should then create a side-part line and then give the strands below it a nice high fade. Keeping your hair natural is the best way to create a refined look like this one. To replicate this style you should trim your hair to about an inch on the crown and then form a curved side part. You should then taper the hair below this line by reducing it gradually to create a lovely design. The long hair on the crown looks unkempt, but this is what makes this a top notch haircut. 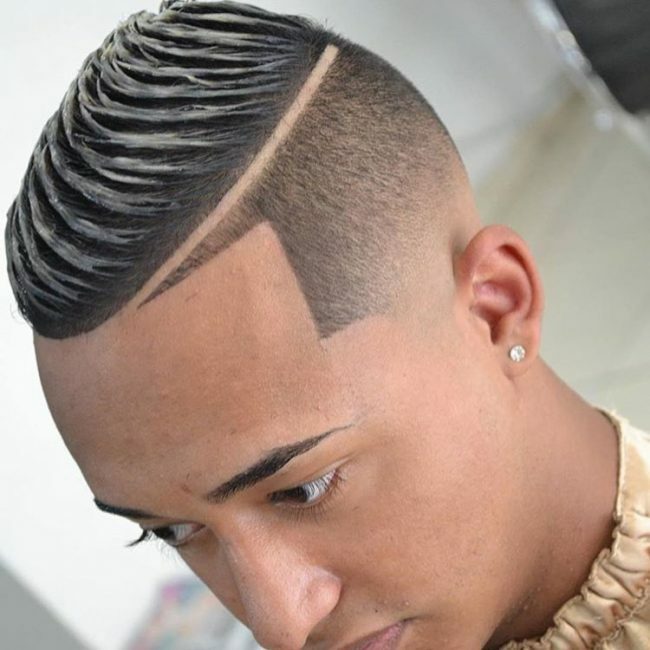 Contrary to how it looks the mess at the top is very fashionable, and it is the barber who makes the hair appear this way. 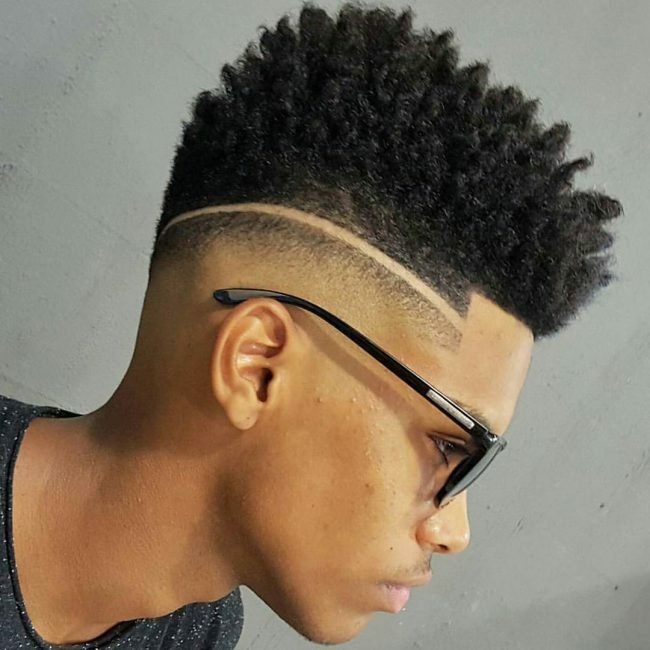 Apart from this design the haircut also has a subtle tapering on the sides and back. A flat top design is very adorable, but you should not just leave it plain and simple if you want to look stylish. You should instead have a zero fade on the sides and then create some stylish razor lines to make your headdress look magnificent. 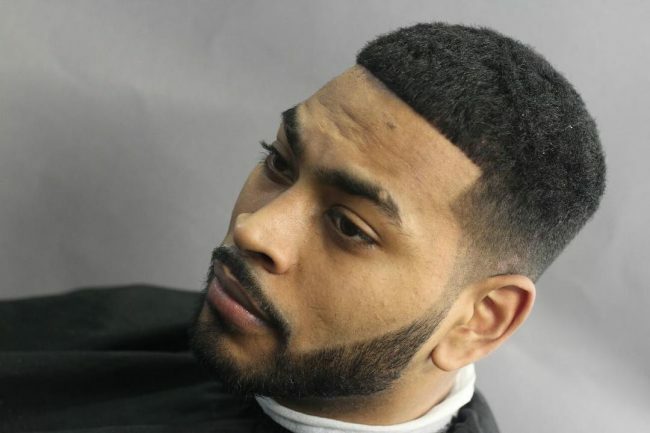 Some men prefer to maintain some uniformity in their haircut, but this should not mean that they should always have simple and dull looking cut. 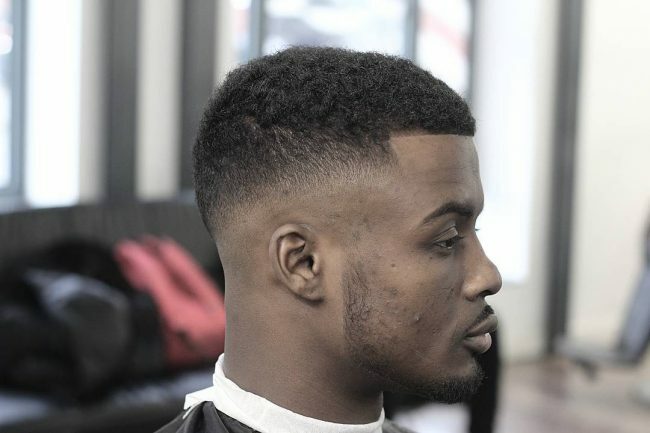 This cut keeps a uniform length but it still looks very stylish, and this is due to the contoured line at the front and the perfect tapering on the sides. The chaos in the long hair and their perfect dye job are some of the things that make this faux hawk look very inventive. However, it also has a smooth fade on the sides that makes it look magnificent. The faded area also has an impressive razor cut line that helps to create a very stylish pattern. This haircut is ideal for every man who prefers formal and low maintenance cuts. It is a very straightforward cut with some smooth waves that make it look very polished. And you should finish the sides with a simple fade that should make the strands on the sides to be on the same level as your sideburns. Contrary to what most people think there are still many ways you can spice up your dreadlocks without having to cut them. In this particular headdress, all that you need to do is to design the locks with some sharp lines on the hairline and then give the growth on the hair a nice fade. Sponge curls offer an easy way to make short strands look fancy, and they are also very easy to create. 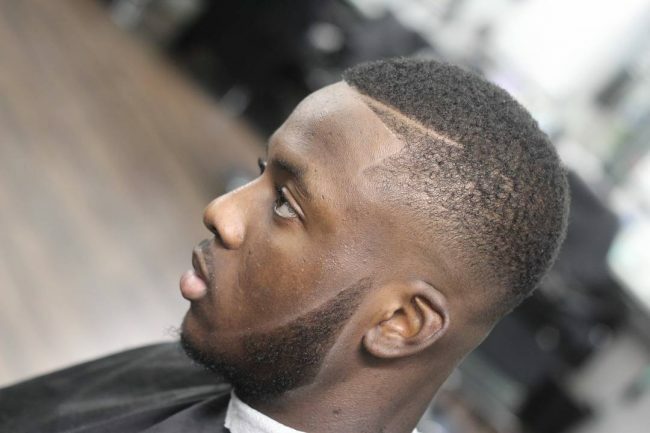 However, you should not just leave them as they are since you can still take this lovely design a notch higher with a skin fade on the sides and by creating some precise razor cut angles at the front. The long and voluminous hair in this design looks very charming, but the smooth and faded undercut still take the appearance a notch higher. It also helps to create a fabulous design by creating a connection between the beard and the hairs on the head. 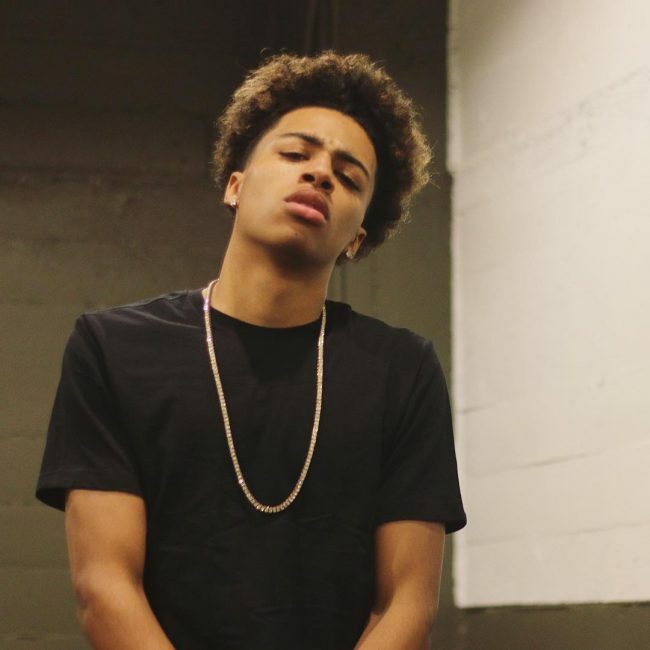 African Americans do not have to make their locks sleek or neat to look amazing since they can still create a stylish appearance like this by maintaining a messy hair at the top. All that you need to do in this style is to ensure that your messy strands face the same direction and then give them a smooth high fade design on the sides to create a fabulous look. The level of precision on the carved side part line in this design is very impressive, and it is enough to convince you to try out this cut. 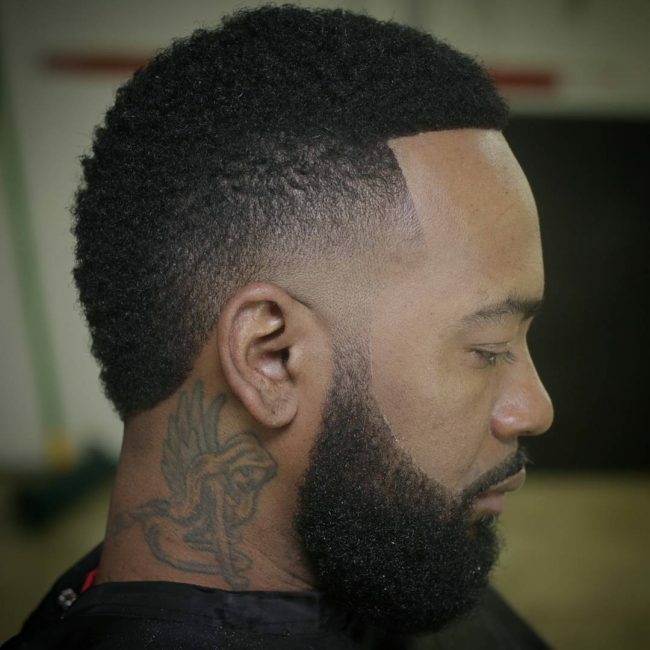 However, there are still other things that make this a top notch haircut, and they include the sponge twists at the top and the slight tapering on the sides. Some intricacy in your styling will always give you a stylish appearance, and this headdress proves this beyond any doubt. It has a very classy braid that will require a high level of skills to get right. 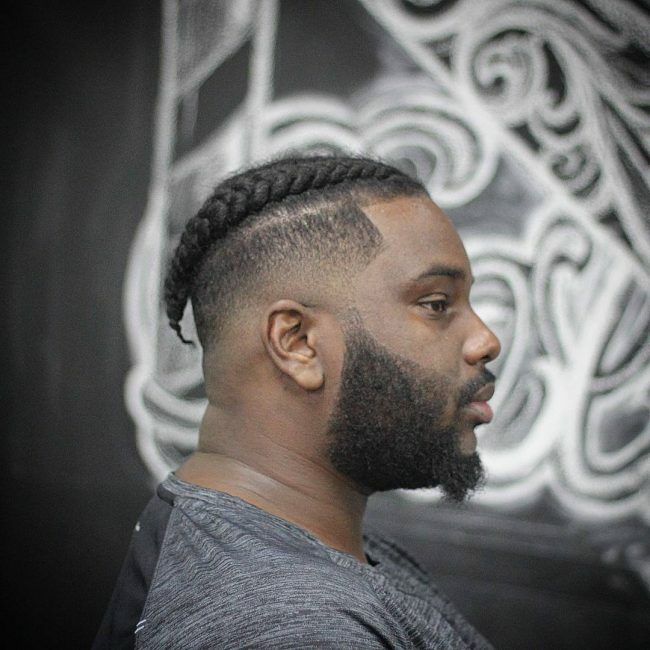 However, the design would not be complete without the sharp fade on the sides as it creates a disconnection with the beard to ensure that all attention remains on the elegant braids. 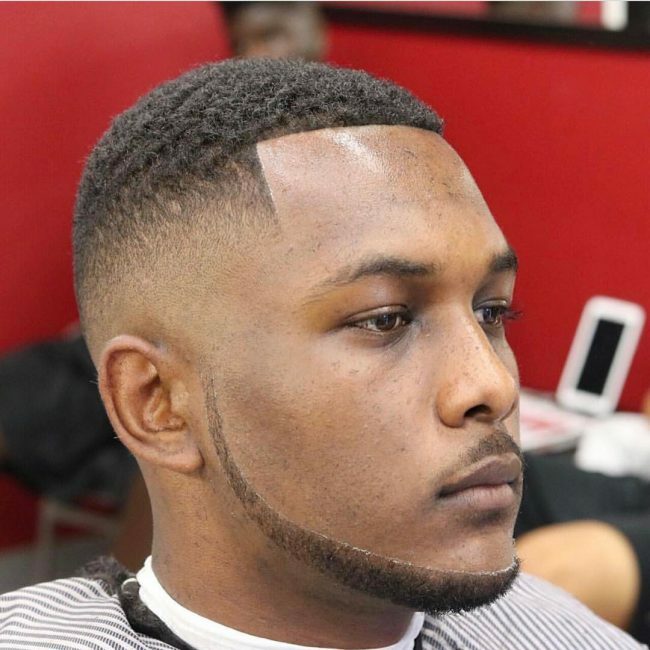 Few haircuts can be as effortless as this one, and so you can almost never go wrong with it even if your barber is not very skilled. It involves chopping the strands short with a razor and then creating a zero taper on the sides to give the design a stylish appearance. You can make the hairs at the top wavy or just leave them as they are if you want to have a natural finish. 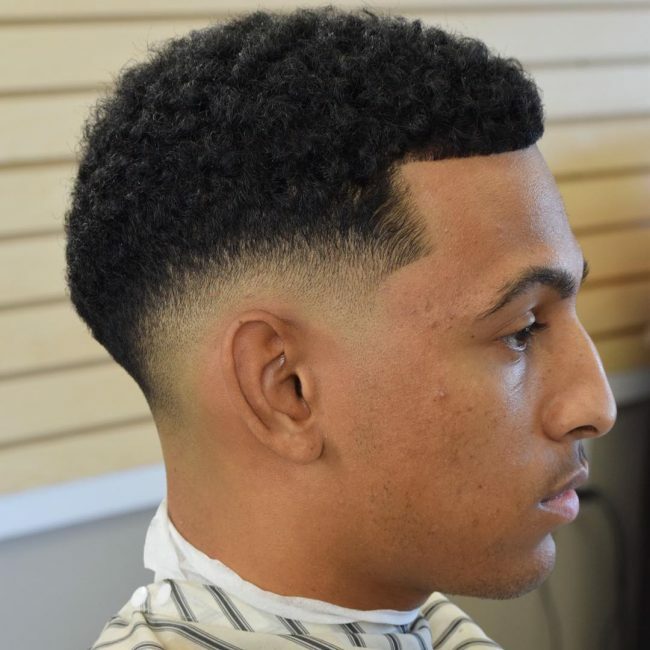 This fresh cut maintains a very natural look, and this is what makes it a fabulous hairdo for every man with a couple of inches of hair. It involves leaving some curly strand on the top and tapering them at the back. You should then fade the sides to create a box shape to finish the design. If you are bold enough to experiment with your hair, then this haircut will work well for you. It involves cutting the sides and leaving the twists sponge in the middle. 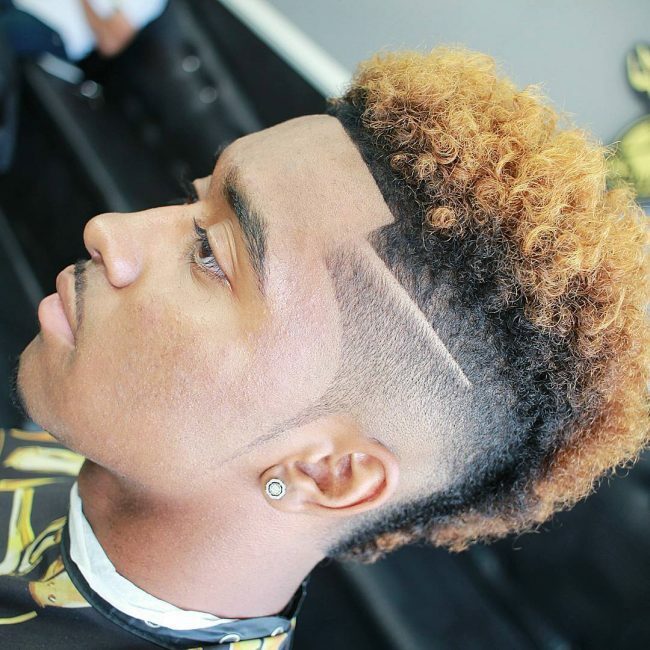 You should then give the twists a brown dye job and finish the style with a zero fade on the sides. Several shaving techniques combine to make this a trendy headdress. The design starts by tapering the strands to make them shorter at the back than those at the front. 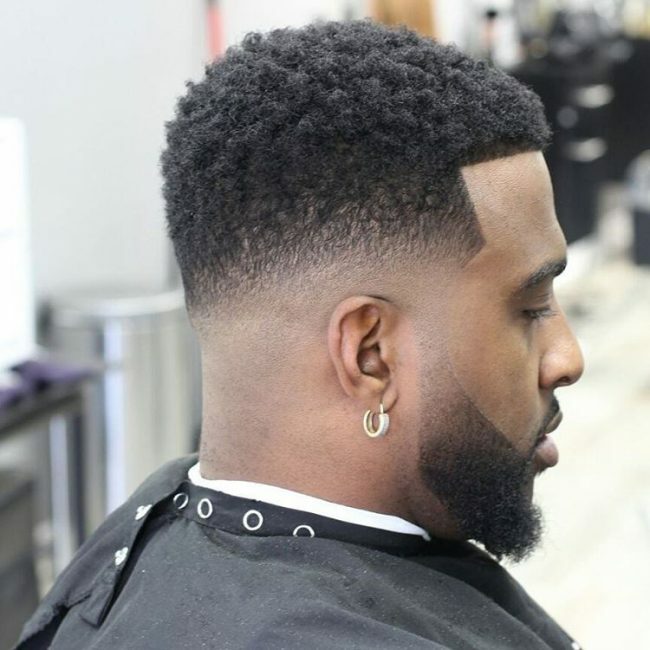 You should then shave the sides inventively to create a V-shape at the back and then finish by giving them a blurry fade just to spice up their appearance. Elegant is an understatement when you are describing this haircut as it is way much more than this. Everything about it is perfect and if you can replicate it you can be sure of a very fashionable look. It involves leaving a long hair on the crown and then pulling then into a neat man bun. 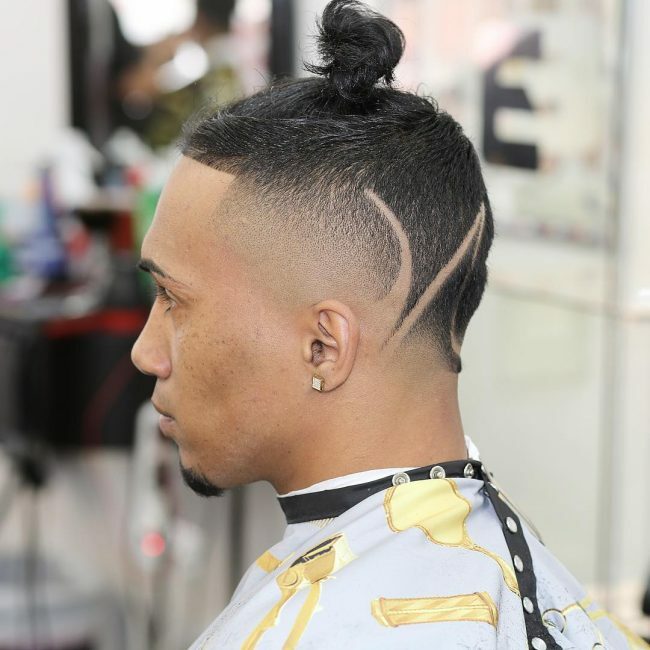 You should then create a stylish V-shape fade below the bun and finish with some fancy designs at the back and sides. This style will look best if you have a natural black hair but you can create it even if you have any other shade. 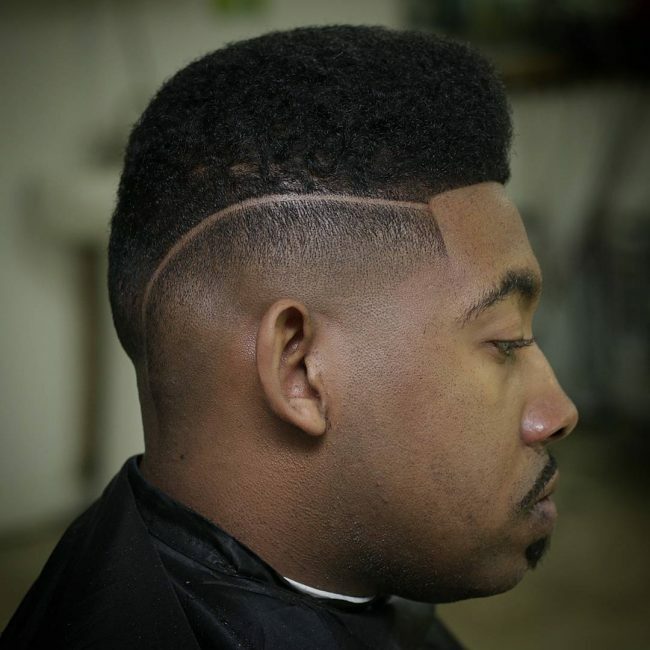 This haircut is a typical high and flat top, but the fade makes it look very distinct. To create this style you should first shave and comb your hair into a box design and then create the reverse V-fade design at the back. You should also create a reverse skin fade below the V as this will help make the design fancy. 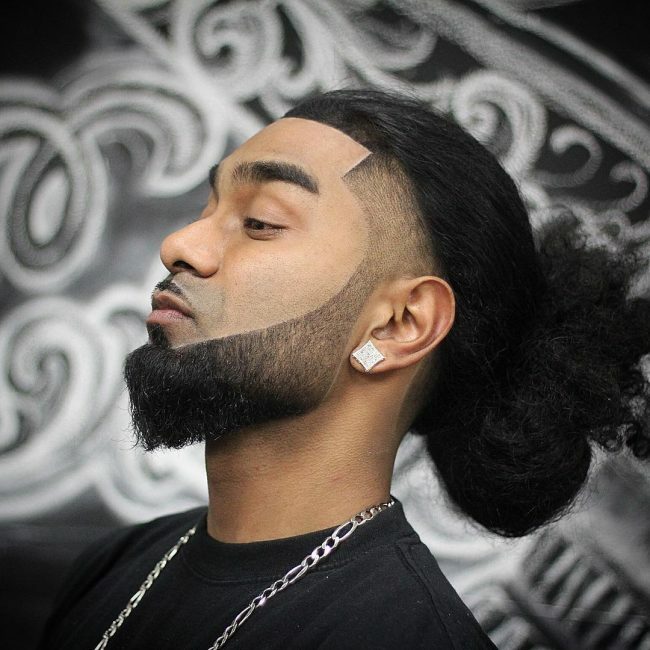 Modern hairdos are about originality because this is what will make a man look unique. In this style there are only two inventive braids on the side and the rest of the hair is tapered. 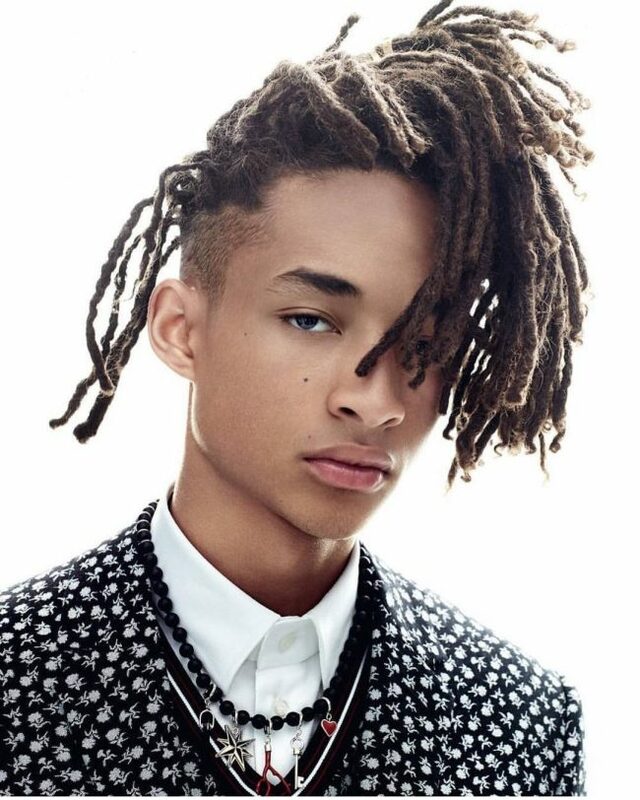 Although this might look like a very easy haircut, it is still very fashionable, and it gives a man a unique appearance. Twists sponge will always make a classy headdress, and they are also very easy to make and style. However, you still need to get inventive if you want to create a unique look because they are very common. In this particular style, the twists have a light blue shade on them, but this is not the only thing that makes them unique. 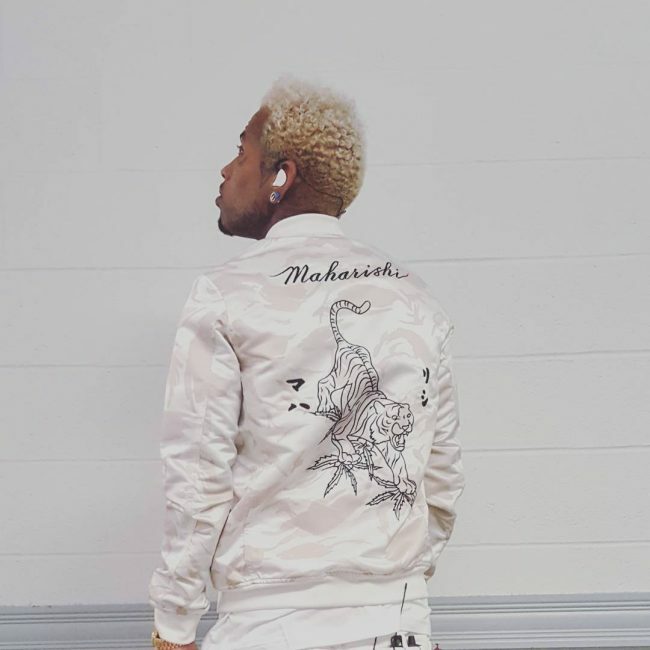 They also have an impressive Mohawk design that comes from giving the sides a high fade. 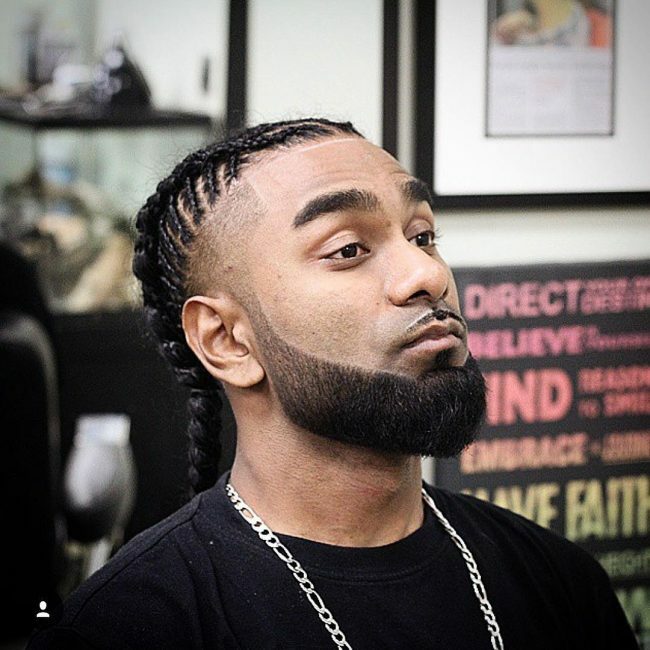 Dreads look amazing especially if you keep them neat and healthy, but the styling in this design takes their appearance a notch higher by introducing come intricate cuts on the sides. And rather than just shave the sides short you should taper them and then finish with some decorative razor lines. 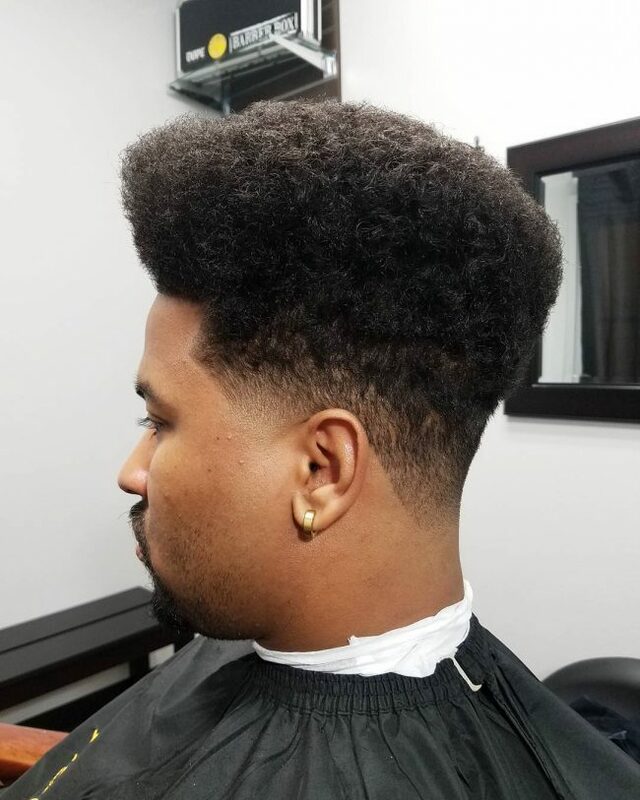 You do not have to go with a flat and high top since you can still create a fantastic look like this by introducing a slant to the cut. The style starts by up-sweeping the front to give it an extra height and then tapering the hair to create the sloping look. 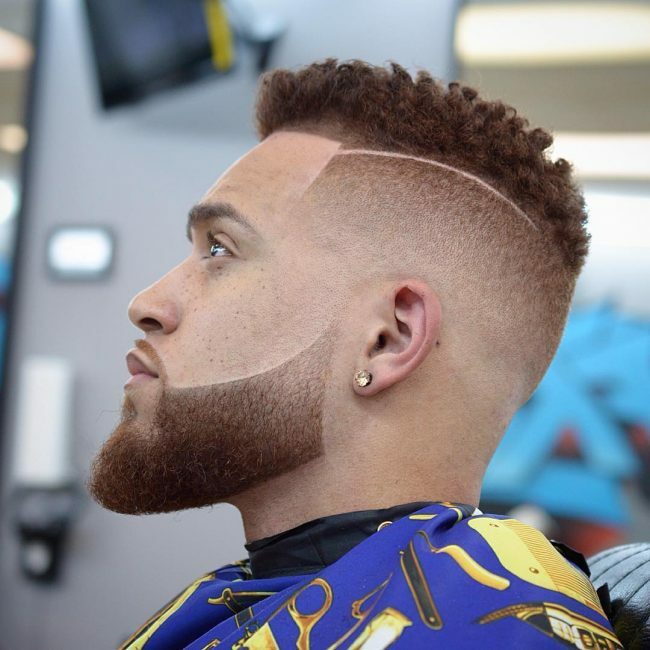 You should then finish with a skin fade on the sides to create a disconnection with the neat and extra long beard. You can call this hairstyle anything that you like, but it will only look good on you if the cut and styling it right. It starts by creating a neat Low Top and then tapering the sides and back to make them shorter than the crown. 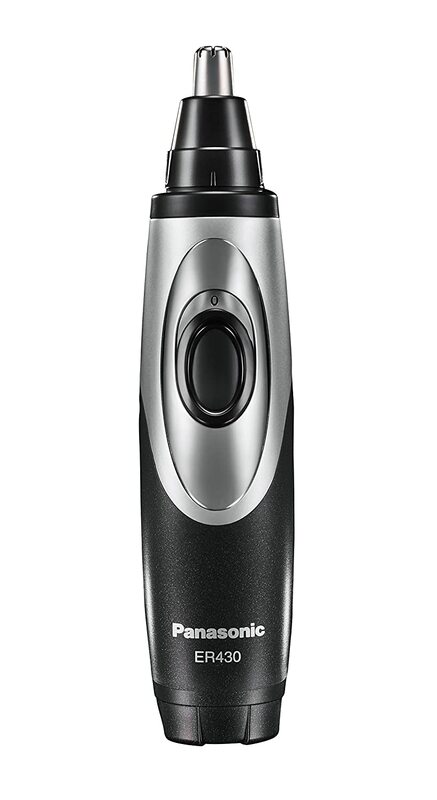 You should then finish the style by razor shaving the neat and precise line that gives it the slash like look. This headdress is very distinct, and it is also very easy to create. You only need to create several multi-directional braids that should meet at the top of the head. To create the top knot, you should tie the braids together and then finish your style by giving the side a zero fade. 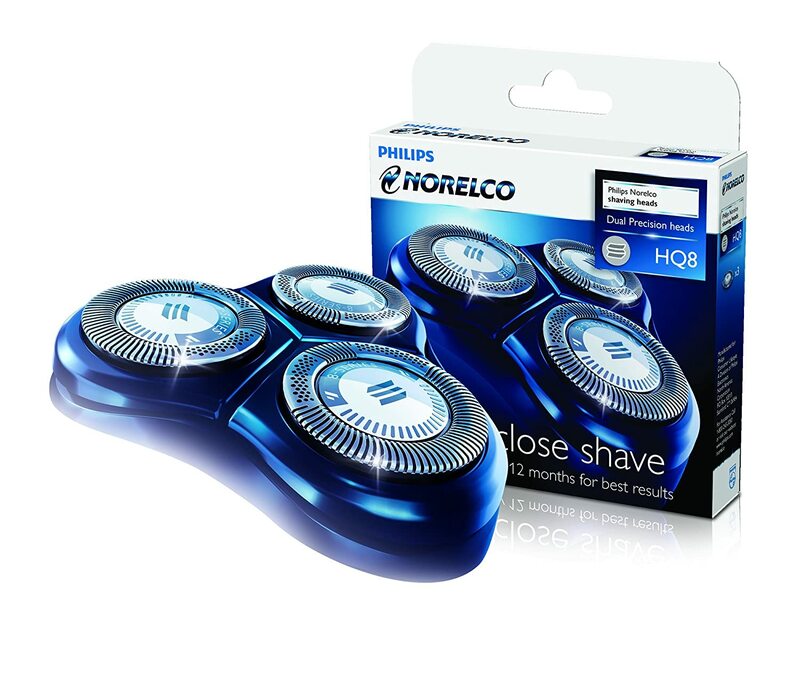 You should shape your facial hairs innovatively so as to enhance the overall appearance. Afros are very simple styles that you can achieve easily provided you have the right length. The one in this design has some messy curls, but it is still as effortless as the others since it has a medium length. However, the faded corners and the angular shapes at the front are what make it look distinct. There is nothing fancy about these dreadlocks because their styling only involves pulling them to the top of the head and tying them into a loose bun. 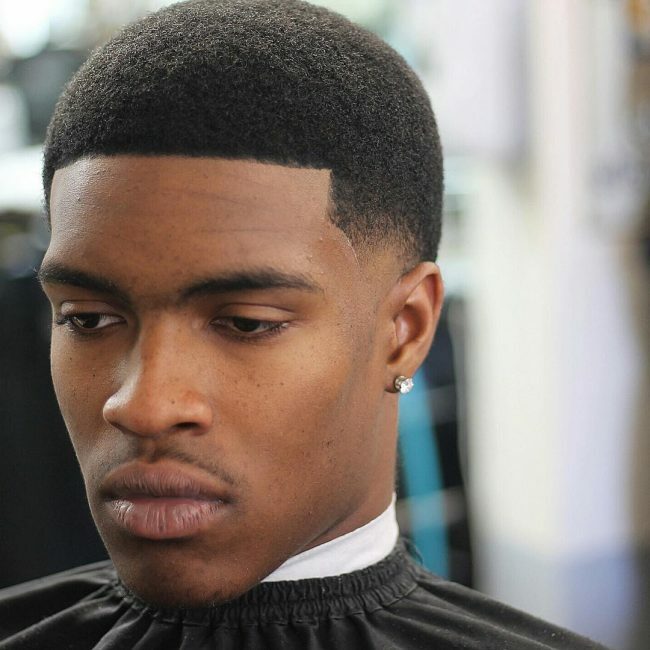 However, the high tapering on the sides is what makes the style look fancy and stylish. The twists sponge look has been in trend for some years now, and so it is quite common. However, you can still make yours look distinct like the ones in this style. All you need to do is to give them an extra height at the front and then finish your style with a smooth tapering on the sides. 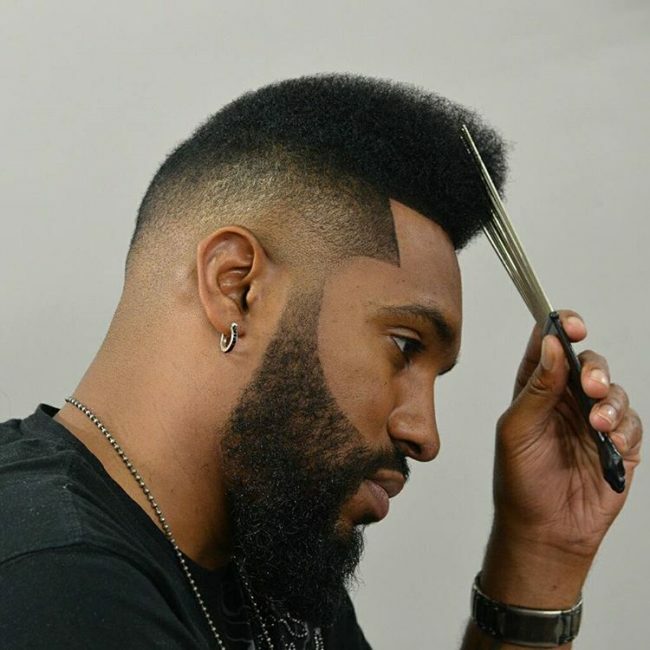 An Afro fade is very popular with African Americans, and this is because it helps them spice up their looks. Whether you have a long or short hair with a simple or intricate style, you can still use this technique to spice up. And the 90 hairdos above will give you some ideas on the different things you can try on your hair.